Born and raised in Niagara Falls, New York, Mark received a Bachelor of Arts degree in Theater Arts from Stony Brook University. He then worked at the legendary Barbara Matera Costumes in New York City as a shopper for a wide range of Broadway, dance and film projects. Following his time at Matera's, Mark studied for three years at New York University's Tisch School of the Arts, and received a Master of Fine Arts degree in costume design. 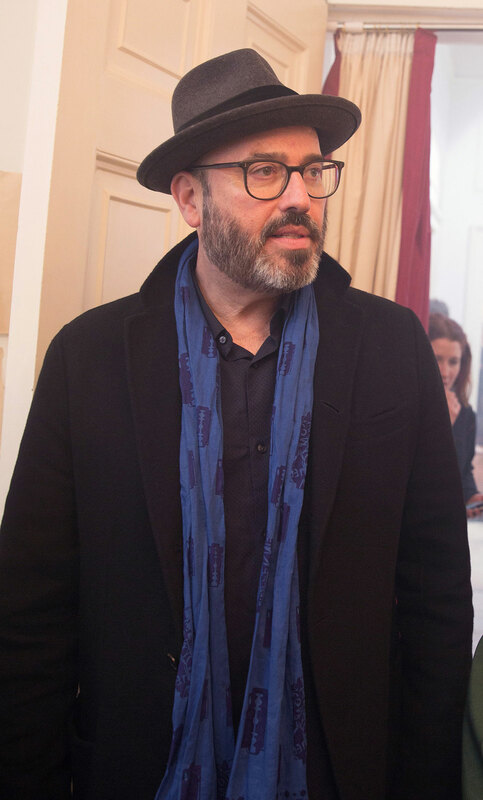 After New York University, Mark began working in film whenever possible and was Assistant Costume designer on the film In the Spirit (1990) with Marlo Thomas and Elaine May, and design assistant to Colleen Atwood on the Jonathon Demme film Married to the Mob (1988). In 1988, Mark worked as design assistant for Richard Hornung on the film Miller's Crossing (1990), a collaboration that would continue for eight more films. In 1989, Mark relocated to Los Angeles to be Assistant Costume Designer to Richard Hornung on The Grifters (1990), Barton Fink (1991), Doc Hollywood (1991), Hero (1992), Dave (1993), The Hudsucker Proxy (1994), Natural Born Killers (1994), and Nixon (1995). In 1995, Mark began his costume design collaboration with Paul Thomas Anderson, designing Hard Eight (a.k.a. Sydney, 1996). Their next work together was on the critically acclaimed Boogie Nights (1997), followed by Magnolia (1999), Punch-Drunk Love (2002) and There Will Be Blood (2008) starring Daniel Day Lewis. Mark also designed The Master (2012) starring Joaquin Phoenix, Phillip Seymour Hoffman and Amy Adams. Mark's seventh collaboration with Paul Thomas Anderson was designing Anderson's Inherent Vice (2014), starring Joaquin Phoenix, which resulted in Mark receiving an Oscar nomination for Best Costume Design. In 2012, Mark won an Academy Award, a BAFTA award and the People’s Choice award for his costume design for the Best Picture Academy Award winner The Artist (2011), directed by Michel Hazanavicius. Other costume design work includes Fifty Shades of Grey (2015) for director Sam Taylor-Johnson, starring Dakota Johnson and Jamie Dornan; The Fighter for director David O. Russell, starring Mark Wahlberg, Christian Bale and Amy Adams; Greenberg, starring Ben Stiller, for director Noah Baumbach; Yes Man (2008), starring Jim Carrey; Fur: An Imaginary Portrait of Diane Arbus (2006) starring Nicole Kidman and Robert Downey Jr.; I Heart Huckabees (2004) with Dustin Hoffman and Isabel Huppert; The Italian Job (2003), starring Mark Wahlberg and Charlize Theron; 8 Mile (2002) starring Eminem; Blow (2001) starring Johnny Depp; Blast From the Past (1999) and Can't Hardly Wait (1998). Mark also designed Captain Phillips (2013) and Jason Bourne (2016) for director Paul Greengrass. Bridges' costume designs were part of the Hollywood Costume exhibition at the Victoria and Albert museum in London England in the Fall of 2012. Mark’s designs were also part of the 1998 Biennale di Firenze Fashion/Cinema exhibit and The Academy of Motion Picture Arts and Sciences exhibit Fifty Designers, Fifty Costumes: Concept to Character shown in Los Angeles and Tokyo in 2002. Mark was also one of the film artists included in On Otto, an installation at the Fondazione Prada in Milan, summer 2007. Bridges' design work has appeared in publications as diverse as Australian Harper's Bazaar, Vogue, The New York Post, The Hollywood Reporter, and the books Dressing in the Dark by Marion Maneker, and Dressed: 100 Years of Cinema Costume by Deborah Nadoolman Landis. Mark’s career and design work is included in the new Costume Design book in the Film Craft series by Deborah Nadoolman Landis (2012).